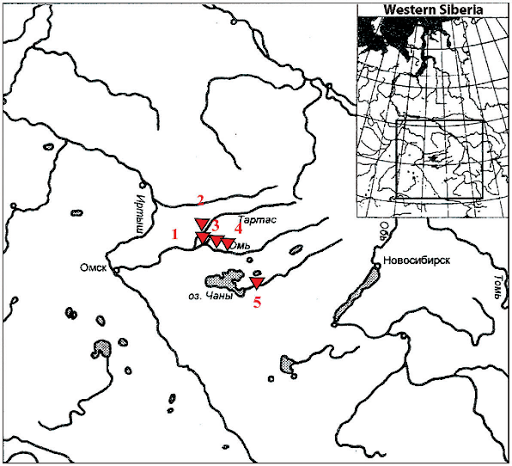 Kristiina called my attention recently to this open access article on the ancient mtDNA of a district of South-Western Siberia known as Baraba. 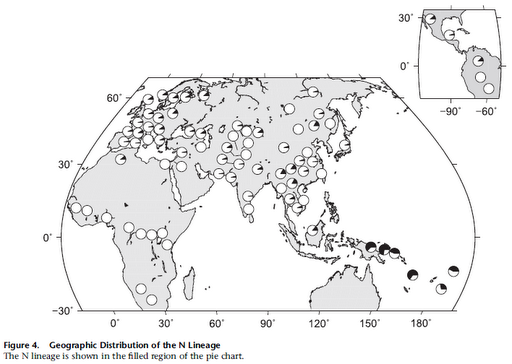 Quite interestingly we see in the data that before 3000 BCE this part of Western Siberia (see locator map at the right) shows already signs of West-East admixture, much earlier than Central Asia did. This fact is consistent with the apparently old admixture detected among the Khanty in autosomal DNA and also with the Epipaleolithic presence of East Asian mtDNA (C1) in NE Europe and the putative Siberian origins of the Uralic family of languages and Y-DNA haplogroup N in NE Europe. The Ust-Tartas culture is part of the wider Combed Pottery culture, usually thought to be at the origins of Uralic peoples in NE Europe and Western Siberia, and shows an almost balanced apportion of Eastern lineages (C, Z, A, D) and Western ones (U5a, U4, U2e), suggesting that the process of admixture was by then already consolidated. However the Odinovo cultural phase shows a change in this trend, with a clear hegemony of Eastern lineages (notably D) and almost vanishing of Western ones. Trend that continues in its broadest terms in the Early Krotovo phase. Odinovo is part of the wider phenomenon known as Seima-Turbino, initiator of the Bronze Age in wide parts of Northern Asia and believed to be original of Altai. However the lineages do not correspond at all with the Altaian Bronze Age genetic pool, fully Western in affinity, excepted those from Mongolian Altai, which are all D. Hence the apparent demic replacement happening in this period must have been from the Mongolian part of Altai or some other region and not the core Altai area. The oriental affinity of Early Krotovo is instead caused by a more diverse array of lineages (less D more CZ and A), which is interpreted materially as reflecting migrations from Northern Kazakhstan (Petrovo culture). However, as mentioned before the known mtDNA pool of Central Asia in that period is completely of Western Affinity, so we must in principle discard Kazakhstan as the origin of the probable demic flows. Let me here mention that the authors insist on continuity through these three phases, however I see a very different picture in the same data, with Western lineages almost vanishing with Odinovo and Eastern ones clearly changing in frequency well beyond reasonable expectations on random fluctuations. It is only in Late Krotovo when Western lineages reappear in significant numbers, probably reflecting, now yes, migrational flows from the South. This trend is clearly reinforced in the Andronovo, Baraba Late Bronze and transition to Iron Age phases, suggesting growing influence from Andronovo culture (early Indo-Iranians). Lots of cobbles have been found in a gully near Dmanisi, Georgia, the oldest known site of Homo erectus (or habilis or georgicus) in Eurasia. The cobbles could not have arrived there naturally and are not found in other areas of the site (Olduwayan style tools have been found instead). The researchers suspect that the abundance of cobbles in the gully was caused because it was a pass our ancient relatives used to attack carnivores, by stoning them, and rob them their prey. The unusually high frequencies of carnivore bones in the site would seem to support this kind of strategy and ratify our earliest relatives as active scavengers who could rob their prey to other predators by using the skills nature gave them: sociality, intelligence and two free hands. Full story at The Great Beyond (found at Archaeology in Europe). A new “bomb” has been dropped by the Paabo team and their Neanderthal Genome Project. This review is just a very preliminary approach to really heavy material, dealing essentially with the autosomal DNA of the Denisova hominins, now sequenced, but also with their relations with Neanderthals and us. A tooth found in the same cave carried mtDNA very similar to that of the finger bone. The tooth is morphologically distinct from both H. sapiens and H. neanderthalensis. 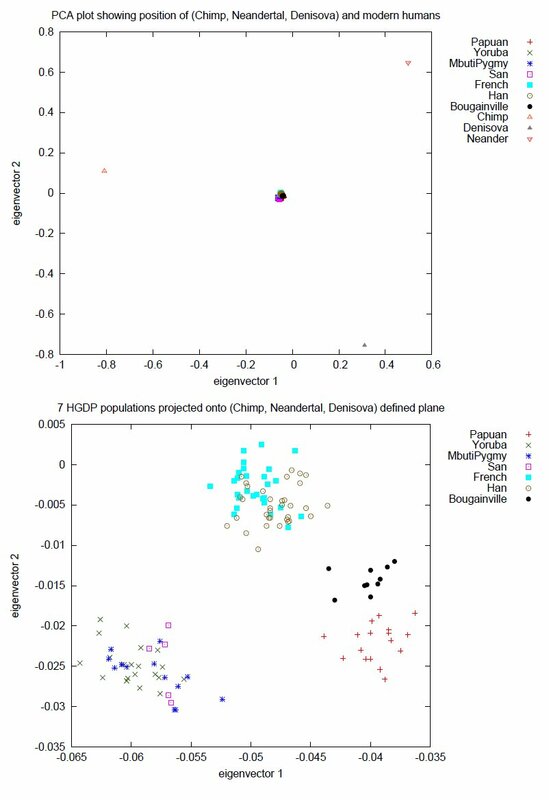 David Reich et al., Genetic history of an archaic hominin group from Denisova Cave in Siberia. Nature 2010. Pay per view (supplementary material is freely available). You are by now probably familiar with the Denisova hominin, a mere finger bone found in a cave from Altai (Mousterian context). While the mitochondrial DNA placed Denisova’s lineage almost twice as distant as our divergence from Neanderthals, the autosomal DNA makes Denisovans a closer relative to Neanderthals (left). However I’d take this with a pinch of salt because autosomal DNA is subject to admixture and may therefore indicate a hybrid population or even individual. For example it could well be the case that Denisovans were a hybrid population of H. erectus and H. neanderthalensis (or a related species such as H. heidelbergensis). Or your best guess. Also you may notice that in the above tree H. sapiens populations appear unusually divergent. This is not a distortion of this graph only, but it is also sustained when the Chimpanzee outgroup is taken into account, yielding age estimates for the autosomal divergence of our species that are several times older than that achieved by comparison of haploid lineages or justified by the archaeological record. So I am quite uncertain on how to read this and if errors are happening that cloud our understanding. Are Melanesians more admixed with Denisovans? Are Native Americans less admixed with Neanderthals? The possibility of Melanesians being slightly admixed with Denisovans is probably the most explosive aspect of the paper. Following Supplementary Information 8, the authors find some greater similitude between Melanesians and Denisovans than any other Eurasian population. Notice that the second image is nothing but a high resolution zoom of the central clump in the first one (H. sapiens). Only at such high resolution three micro-clusters can be noticed, apparently reflecting different admixture levels with Neanderthals and Denisovans. To further clarify this matter, the authors resort to statistical methods that confirm these clusters and maybe add some information on several individual populations’ admixture levels (not anymore just the four Eurasian populations represented above but also others). These calculations show that effectively Melanesians are slightly but significantly closer to Denisovans, while also retaining the general Neanderthal admixture of all non-Africans (or almost all). And I say almost all because the Karitianas (a Native American nation of Brazil) are found to have much lower Neanderthal blood than other non-Africans. Additionally Melanesians have c. 4.8% of Denisovan genetic contribution, totaling c. 7.4% of archaic admixture. Update (Dec 25): it may well be only 4.8% of total archaic admixture if Denisovans were hybrids of Neanderthals and H. erectus (see here – scroll to near bottom). Note: I have a technical doubt because in table S8.2, French appear quite closer to Neanderthals than Sardinians, who seem less admixed than all other non-Africans but the Karitiana, but in table S8.3 they are given the same values of admixture. At the moment I do not understand why this difference in the values, really. In the same table S8.2 French, Han and Cambodians (and only them) also appear to show some admixture with Denisovans, though maybe a third or fourth of that of Melanesians. Affinities of the Denisova tooth, chronology of the Denisova cave. In Supplementary Information 12, the authors deal with the possible paleo-anthropological affinities of the Denisova tooth (a molar), finding that it is closest in morphology to those of Australopithecus sp., H. habilis, African (but not Chinese) H. erectus and (oddly enough) Oase 2 (a H. sapiens that does not cluster with the rest of our species in this aspect). Indonesian H. erectus is also very close if it is a second molar but not if this is a third molar. H. sapiens (other than Oase 2), H. neanderthalensis, Chinese H. erectus, H. georgicus (Dmansi), H. antecessor/heidelbergensis (Atapuerca) do not cluster in any case. … we propose the following scenario: a first hominin occupation of the cave more than 50,000 radiocarbon years ago by the Denisova hominins, and a second occupation during the Upper Palaeolithic, at 30,000 years BP or later, probably by modern humans. Update (Dec 23): Denisova mtDNA “modern”? Dienekes mentions today that Niccolo Caldararo has published an article at Nature (freely available as PDF) suggesting that the Denisova mtDNA sequence may be corrupt. If this would be true, then the sequence would be that of a H. sapiens. This could explain some of the anomalies in the autosomal NJ tree and related age estimates, that would make Chinese and French (for instance) diverging by more than 500,000 years, what is totally absurd. However, considering that a very similar sequence was successfully sequenced also for the tooth, this claim seems less likely. Still many questions remain open because there are issues such as the divergence estimates for various H. sapiens, specially Eurasian H. sapiens, that just do not make any sense at all. So I’d say it’s best to lay back a bit and wait patiently for more brilliant insights, which will no doubt come. Update (Dec 25): see this new review for a more elaborate review of mine on this matter, including some intriguing hypothesis I am launching, partly on feedback provided by commenters. German researchers have successfully retrieved mtDNA from 85 ancient specimens from diverse Eurasian regions and periods, ranging from c. 12,000 BCE to the Middle Ages. They have found that most of the extant mtDNA diversity in the species existed before domestication. 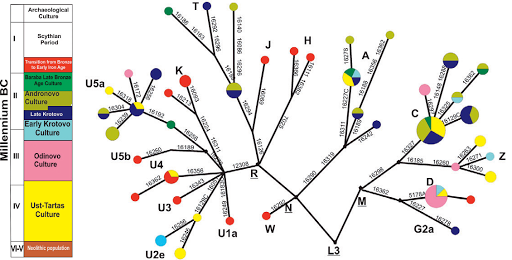 M. Cieslak et al., Origin and History of Mitochondrial DNA Lineages in Domestic Horses. PLoS ONE 2010. Open access. 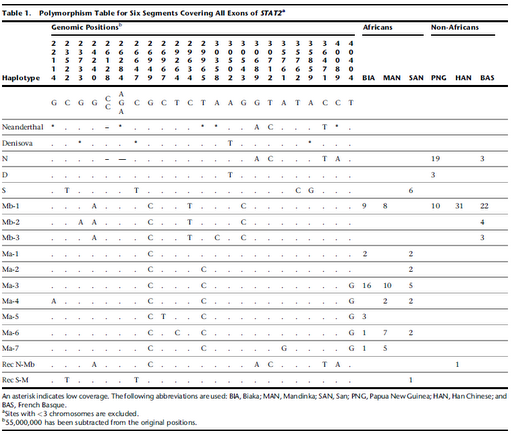 The paper provides ample insight on the various haplotypes and where they are found first. 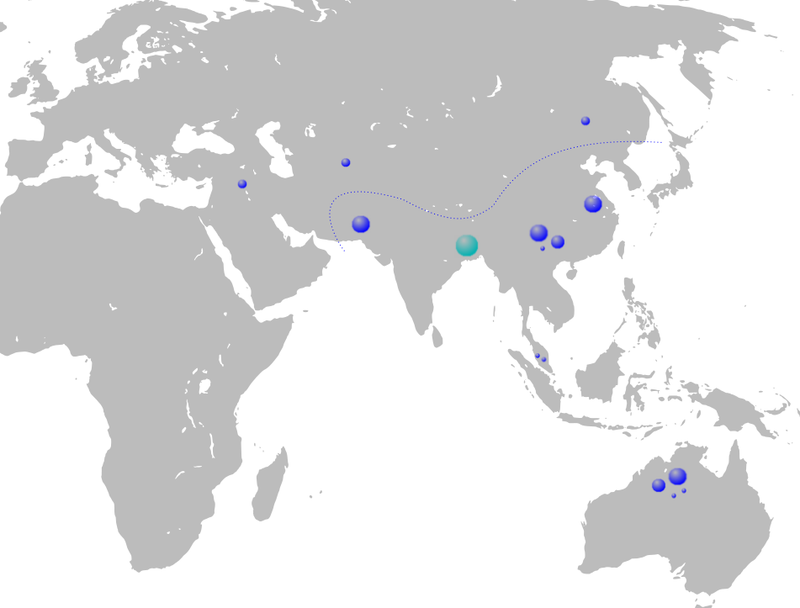 Not all lineages are from the putative area of first domestication (the Eurasian steppe) but they are also from other regions (East Asia, mainland Europe, Iberia). They also researched primitive horse breeds. 39 haplotypes were confined to one of these breeds. Among them are notable those of the Iberian peninsula (Lusitano, Marismeño, Cartujano, Garrano), which appear to have roots in pre-Neolithic local wild horses. Similarly the Basque pony known as pottoka also has roots in ancient mainland European horses (X1, derived from D). [Correction (Apr 6 2011): Pottoka’s matrilineage X1 is of apparent Siberian origins: C – only attested in one individual. X1 as such is only documented since the Iron Age, in mainland Europe]. Other primitive breeds with unique haplotypes are Arabian, Cheju, Akhal Teke, Sicilian Oriental, Yakut, Debao and Fulani. The authors argue that the Altai Mountains and the Takla Maklan and Gobi deserts were barriers partly impeding the genetic flow from the Eurasian steppe to East Asia, where several of these breeds belong. Update (Apr 6 2011): see also to this more recent post: Horse’s double origins, on new research supporting by means of autosomal DNA diversity the double origin in the steppes and SW Europe of modern horses.